I still find it hard to believe it is possible to separate flint nodules into identifiable categories from the millions visible on a beach. I was showing the two nodules in Fig.1 to Mike Lambert when I realised the centres were the same basic form of a tapering cone with 'toe' curled one way. Both had come from Plantation quarry, near Ashwell. The rear nodule had been found upright and in situ, toe pointing north east in the quarry wall. The front nodule was loose in the chalk on the quarry floor. Its surface is heavily striated and had obviously been in a fast current environment as had other nodules I found that day. It made me aware that flints were indicative of the differing conditions on the ancient sea floor. Three, early stage, Type A's. On the Glynebourne flint in the centre, ‘Protoflint’ the silica saturated sediment that sponges produce, flows around the sides and spirals down the back of the flint. The cone shaped top, Tecta or roof, here bent backwards by the strong tide, was the sponge’s way of shutting down. When conditions were deteriorating sponges produced survival cells (gemmules) and raised them high above chalk deposition. Type A on right; from beneath Cromer pier, reveals sponge fossil within and dark toxin build up to lower area. Type A on left; a soil flint; shows the same basic form with sponge detail revealed at broken top and base. The dark bronze area is the toxin deterrent sponges deploy around the structure to prevent predation. Eleven Type A's (top left is a joined double). Sponge larvae settle on a suitable substrate and develop into the cone or vase shape as seen above. The cone is knocked over by the tide and the sponge develops from the larger basal area. Top line left and centre, sponge pyrite fossil remains on the cortex. Bottom line centre has turned upwards and is growing into a paramoudra. All show typical Type A format of one bulge right, two on the left and direction of growth to upper right which would have been north east. This in situ paramoudra at West Runton shows the whole process. The toe is below the flint to the right of compass and the cone has fallen and grown in a north east direction. Just to the left of the compass is some pyrite sponge fossil breaking the surface and the paramoudra has grown to the left of that with a central chalk core and some good sculpting to the upper rim and sides while a rimprint is visible around the inner rim. The protuberance to centre top is part of the reproductive process and they tend to have developing larvae within the flint. 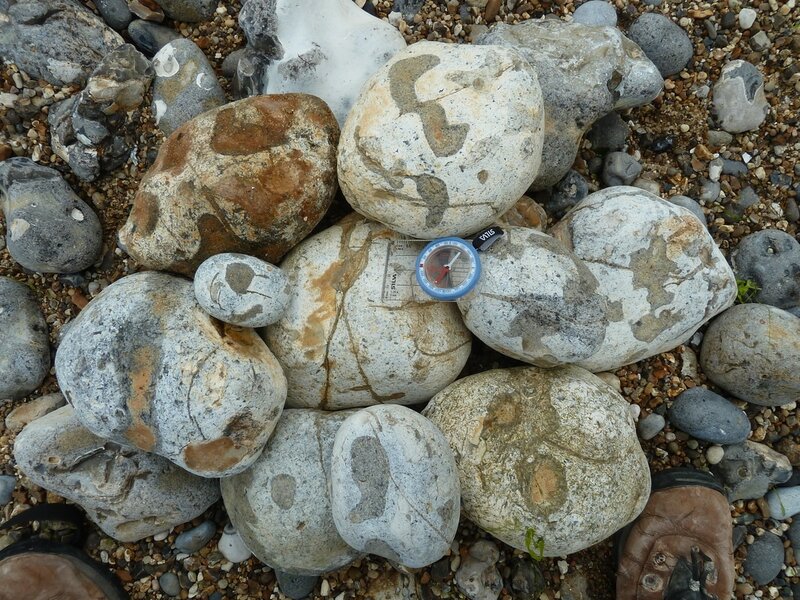 These are a fairly common find at Sidestrand beach, Norfolk as well as West Runton and range in size, in this picture, between 105mm down to 38mm diameter. ​Top right and bottom left show a 'nostril' where the sponge is begining to emerge often showing more than one exit hole for the tail(s). Pure conjecture (at the moment) would be to suggest these are the protuberances from Paramoudra that were 'blown' off the sides by the tide and rolled into these spherical shapes as a way of distributing offspring. A similar process could also account for nodular flint. Type B nodule cracked open reveals developing sponge was about to emerge from top. Close up of tail shows filament array. So, do Type B develop into Paramoudra parva? Do lumps of flint spin off nodules and paramoudra? Some of the nodules I found at Ashwell had, not only, Inoceramus debris across the surface but spots and blodges of silica. It was like a custard pie fight had been going on between sponges. 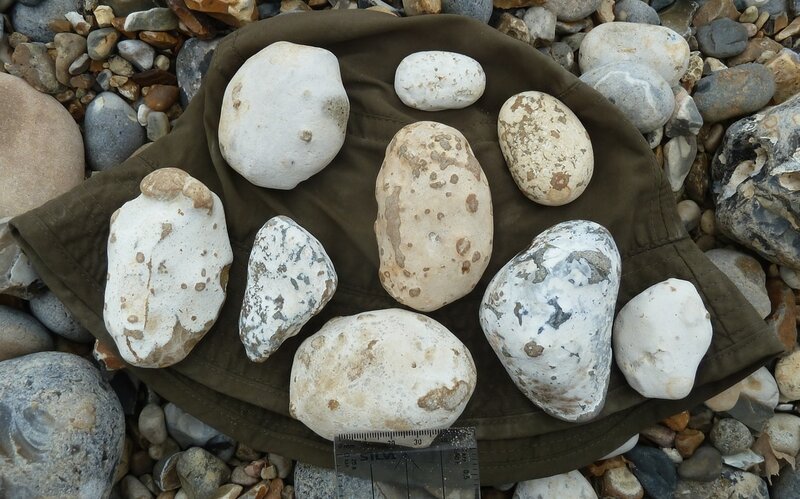 It is very fast water environment, you can tell by the tortured shapes of the flint, so I think it quite likely surface protoflint would be removed and redeposited as embryonic silica gel. Type C nodules are between 40 and 75mm and show surface markings where the canals have turned to Chalcedony, being harder than the flint, they protrude above the creamy coloured cortex. These 9 type C were found in a 200m stretch beneath the Beeston Bump, Norfolk. These are not found to the east of West Runton in this sort of numbers. Various sponges colonised different areas of the reefs so the beach above reflects this tendency in the types of nodules found. Being close to the reef i.e. the source, means all these types of nodules are 'fresh' the surface detail has not been obliterated by the wave action as it has on most beaches. All of these types of nodule are different fossilised sponges. Type 'E & N' nodules. Still to be photographed.